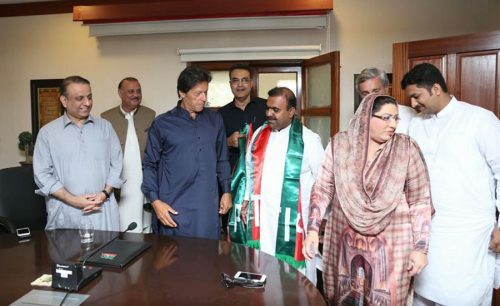 ISLAMABAD (92 News) – Pakistan Peoples’ Party (PPP) leader Nadeem Afzal Chan’s brother Waseem Afzal Chan has on Wednesday joined Pakistan Tehreek-e-Insaf (PTI). Waseem Chan is younger brother of senior PPP leader Nadeem Afzal Chan. Waseem Chan met PTI chairman Imran Khan in Bani Gala today and formally joined the party, while PSF Sargodha President Ehtesham Tarrar also joined PTI. The ceremony was attended by PTI leaders Jahangir Tareen, Aleem Khan, Firdous Ashiq Awan and Nazar Muhammad Gondal. Imran Khan welcomed Waseem Chan and Ehtesham Tarrar for joining the party. On the other hand, the PTI chairman will visit Sindh for four days from October 22 and Imran Khan will address the public gathering in Sehwan Shreef. He will hold separate meetings with traders and members of Khyber Pakhtunkhwa Union on October 23.